What once was a small area out on the 215 that people from OC and LA were moving too, to get away from traffic and live in the wide open spaces has become Riversides 26 city. Out in what used to be the wide open spaces south of Hemet area 3 small communities have grown up out of the sage brush and rolling hills and the southern range of the Santa Ana Mountains.....They are Sun City, Romoland and Menifee....The new community will be known as Menifee Valley, encompassing some 600 square miles north of Temecula. 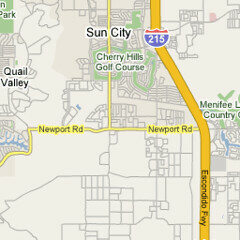 Sun City is a census-designated area in Riverside County......The population was 17,773 at the 2000 census......Sun City is the a master-planned community for active adults (the club's catchphrase for senior citizens over age 55) built by Del Webb in the 1960's.